First stepping onto a standup stage in June of 1998, his talent gained instant recognition as he won his first national standup award less than 12 months later. 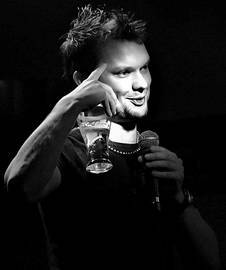 8 years on his televised performances have spanned Australasia, he�s headlined comedy venues in New Zealand, Canada, the USA and the UK, and been nominated by his fellow performers for the title of NZ\\\\\\\'s Best MC. In his last New Zealand International Comedy Festival he was nominated for the NZ Comedy Industry\\\\\\\'s supreme award, and described by �The NZ Herald� as one of the highlights of the televised international gala. \\\\\\\"I�m rewarded for my spontaneous Monday night frivolity with a blast of hilarity courtesy of Sully O\\\\\\\'Sullivan. A huge waft of energy blasts off the stage as soon as the kiwi takes the microphone.\\\\\\\"
\\\\\\\"He�s a veteran. You can tell by the confident stance and risqu� material. Not many stand ups challenge political correctness in quite such an abrupt way.\\\\\\\"